Parents worry about their children being bullied online, but what if it is your child who is doing the bullying? That was the question posed by a BBC reader, following a report on how children struggle to cope online. There is plenty of information about how to deal with cyberbullies, but far less about what to do if you find out that your own child is the source. 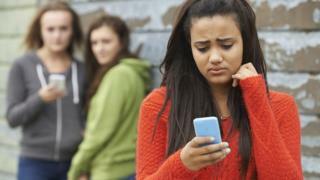 The BBC took advice from experts and a mother who found out her daughter had been cyberbullying her school friends. Few parents would want to admit that their child was a bully but Nicola Jenkins has gone on record with her story. You can watch her tell it here. "Nobody thinks that their own child is saying unkind things to other children, do they? I let them go on all the social media sites and trusted the children to use it appropriately. "Our form tutor phoned me up during school hours one day to tell me that there'd been some messages sent between my daughter and two other friends that weren't very nice. One of the children in particular was very upset about some of the things that had been said to her. "Her friend's mum spoke to me about it and showed me the messages that had been sent. When I approached my daughter about it, she denied that there had been anything going on. It took a while to get it out of her, but I was angry with her once I actually found out that she had been sending these messages. "I spoke to her teacher and to the other parents, and between us we spoke to the children to let them know that they can't be saying unkind things and to just make them aware that whatever they do is recorded and can be kept. And they all did learn a lesson from it. "I removed all the social media websites from her so she wasn't able to access them for a while and then monitored her input and what she's been saying to people. "But it did make me feel angry and quite ashamed that my daughter could be saying things like that to her friends, but she has grown up a bit since then and she's learnt her lesson. "You want to trust your children, but they can get themselves into situations that they can't get out of. "And as they get older, they look at different things. I know my son looks at totally different things to what my daughter does, so it's just being aware of what they are accessing and make sure that they are happy for you to look at what they are looking at as well." According to not-for-profit organisation Internet Matters, one in five 13-18 year olds claim to have experienced cyberbullying but there are few statistics on how many children are bullying. "First, sit down with them and try to establish the facts around the incident with an open mind. As parents, we can sometimes have a blind spot when it comes to the behaviour of our own children - so try not to be on the defensive. Talk about areas that may be causing them distress or anger and leading them to express these feelings online. "Make clear the distinction between uploading and sharing content because it's funny or might get lots of 'likes', versus the potential to cause offence or hurt. Tell them: this is serious. It's vital they understand that bullying others online is unacceptable behaviour. As well as potentially losing friends, it could get them into trouble with their school or the police. "If your child was cyberbullying in retaliation, you should tell them that two wrongs cannot make a right and it will only encourage further bullying behaviour. Stay calm when discussing it with your child and try to talk with other adults to work through any emotions you have about the situation. "Taking away devices can be counterproductive. It could make the situation worse and encourage them to find other ways to get online. Instead, think about restricting access and take away some privileges if they don't stop the behaviour. "As a role model, show your child that taking responsibility for your own actions is the right thing to do. Above all, help your child learn from what has happened. Think about what you could do differently as a parent or as a family and share your learning with other parents and carers." Many critics blame social media for not doing enough to deal with cyberbullying. Abuse is prolific on Twitter and it has pledged to do more, including improving tools that allow users to mute, block and report so-called trolls. "As a mother of a seven-year-old boy, I've always tried to strike the right balance between promoting internet safety and encouraging the type of exploration, learning and creativity that the internet can unlock." "If you find that your child is participating in this type of behaviour, a good first step is to understand the nature of the type of material they're creating, who is the target, and try to ascertain their motivations. "If the bullying is taking place on a social media platform, make sure to explain to them why the behaviour is inappropriate and harmful, and to supervise the deletion of the bullying content they have created. If it continues, it may be worth seeking additional advice from a teacher or trusted confidant."